We can disagree without being disagreeable. One of the many demonstrations of this came a year before I was born, when John Berger and Susan Sontag sat down facing each other to record an episode of the Channel 4 series Voices. After a somewhat awkward start, the conversation becomes more intimate. Almost as if they are our more intelligent friends, sat opposite each other a little down the dining table from us, they share their opinions on the nature of storytelling. In the days after Berger’s death, I rummaged around online, watching and re-watching videos of him. This encounter I watched for the first time, initially just out of interest in whatever these two might have to say. But as the discussion progressed, I realised their observations cast a long shadow. Not only over oral and literary traditions of storytelling, but reaching at least as far as my own chosen challenge of writing history. With my own research moving from being focused on the younger days of my grandmother to my own formative years, I’ve been grappling lately with just how different these two tasks are – writing modern history and contemporary history. Both are recent but, for me at least, one has just about settled into the past. The other has yet to settle. Most importantly, one is somebody else’s lifetime, somebody else’s story. The other is mine. Perhaps the ground was laid for me to accept the advice of Berger and Sontag when he threw in the observation that “the story exists somewhere between fiction and truth”. In their comments about truth and invention, and then whether a story is bound by the time and place in which it is set or whether in the reading it becomes universal, it struck me that much of this applies to my task too. And as the conversation went on, they reached an exchange that really resonated with the challenges I’ve been tackling as my research becomes more contemporary – writing a history that is unfinished. Sontag: But do you really think that a life is only intelligible when it’s over? I don’t think so. Berger: Intelligible? No. It’s full meaning is only apparent. It’s intelligible, it’s understandable before, of course. Sontag: But then you are saying that the central thing about storytelling is to tell a life and if the maximal understanding of a life only comes after death then the basic model of storytelling for you, of narration for you, is telling the story of a life. And that’s where I don’t agree. I think that’s a very interesting model and I suppose it is an archaic model, not the only one. Because there are other stories that are told which don’t involve simply a single life but involve an event like a campaign in a war or something of that sort… I still baulk at the idea that the fundamental thing about storytelling is telling the story of a life, or I presume you would expand that to mean a series of lives, it could be a family or a community or whatever. Don’t you think there are many other kinds of storytelling? And don’t you think there are lots of wonderful narrations whose central strength is the depiction of character, in which incident is relatively unimportant or only illustrative? I mean there’s an awful lot of modern storytelling in which action is relatively immobilised and what story there is, is almost presumed to be known and therefore the main part of the storytelling is really a comment on a story. A comment on what one already knows to be happening. It’s not in the and then, and then, and then form. And I think this is a great achievement. I think we’ve enormously expanded the resources of storytelling. Indeed, there are different kinds of story. And there are different kinds of history. For the contemporary chronicler, perhaps, Berger has nicely articulated the problem. Giving an account of events without knowing what comes next leaves you open to pitching or framing the story in a way that can look odd by the time it’s read. It doesn’t take a prediction for the moral of the tale to appear misjudged if a rise to glory turn out to be hubris before the fall. We might say then that hindsight is the bedrock of writing history. Without knowing the end of the story, it gets its shape and sense of direction from answering the question: how did we get here? The trouble is, as recent political events have reminded us, it doesn’t always pay to be too sure of where exactly here is. Events, dear boy, can move the ground beneath our feet at startling speed. Certainly much quicker than the time it takes for the historian’s ideas to become words in print (blogging aside, perhaps). But what about this other form of storytelling as comment that Sontag mentions? Our equivalent in historical writing here is surely the new frontiers of cultural history opened up in recent decades. And it is here I find myself as I seek to make sense of the myriad meanings attached to the NHS as a ‘free’ health service over the past seven decades. 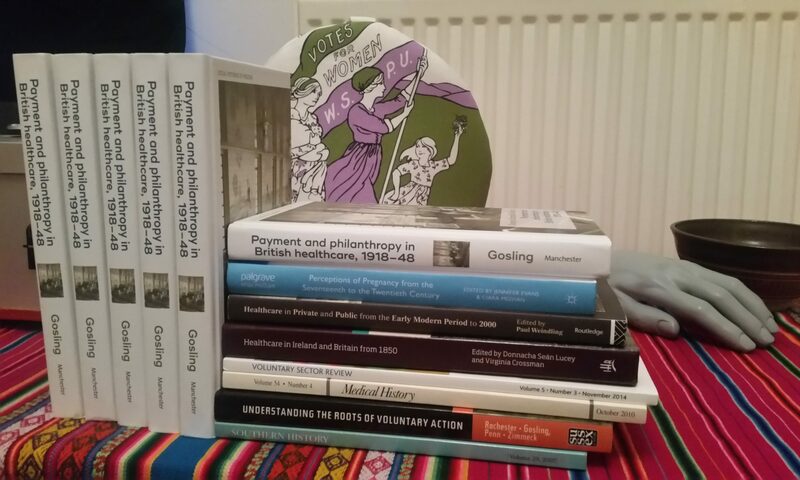 For my part, I feel just as able to understand social and cultural meanings of the NHS in the earlier part of its history as I do the meanings of paying the doctor or the hospital before the NHS (by chance, the subject of my forthcoming book). But I do find it harder get my bearings when seeking to pin down how those meanings changed in the second half of the NHS’s history since the 1980s. Maybe the reason is that this sort of history doesn’t really break from the storytelling of a life, since it’s still ultimately one strand in a biography of an institution: the NHS. Yet, I do see this much more as comment on than telling the story of the NHS. I’m not trying to explain why the NHS is the way it is, whether it can be judged in the final verdict as a success or failure, or even if will survive much longer. So perhaps, instead, the difficulty is that the NHS is a subject matter hard to separate from those political events continuing to unfold. I suspect my difficulty is not really so much in the challenge of making sense of the NHS’s cultural meanings, as challenging as that is, but more in that of how to present that insight as historical exposition to an audience for whom this is living memory. Maybe it’s not so much me, the historian, who needs that separation as it is the audience. Here I found myself thinking that much the same could be said of ‘the historian’ as Berger said of ‘the storyteller’. Sontag: Hearing stories from everywhere? Berger: Yes. So that, what happens is that that story which may be some tiny little affair in some tiny village or some backstreet or a city is somehow placed in the modern world. How? Not by crude statements of comparison or of historical argument or political argument. It’s a very very subtle process. Somehow you have to give the feeling that what is being narrated there co-exists in the world where China exists and the Pacific Ocean and there are men who have been to the moon. Sontag: But I see a bigger difference between us. Because you see the world as full of stories and then you see these special people who constitute themselves as storytellers… and they tell these stories. They are the bearer of stories. They are the transmitters or emitters of stories. Sontag: The vehicles. The secretaries, if you will… I don’t see that the world is full of stories in that sense. I mean I think that the story starts with the writer. For better or worse, academic historians are rarely burdened with any suggestion their writing should be free from crude statements of historical argument. Far from it. So our contextualisation is a less subtle process. Otherwise the challenges of the historian are much the same as those they outline for the storyteller. Of course, Sontag is speaking of fiction writing rather than the narration of the past – though I would argue (and have) that the same can be said of history writing – and their conversation moves away from our second meaning. But there is plenty here for us to think about, even before this divergence. According to Berger, storytelling is not only about giving shape (a life) but also finding meaning – what he elsewhere in the discussion called “the fight against the absurd”. This, of course, is more than finding meaning. In doing so he is suggesting that the meaning of any and every story speaks not to the absurd, the fantastical, but to the lived, the real, the experienced. Sontag’s storytelling can be escapism, Berger’s is reflection. Applied to the writing of history, the equivalent of Berger’s storytelling might be a recounting of the past that speaks to the world in which it is written and read. It is chronicling, in the best possible sense, with its corollaries both of explanations to be offered and lessons to be learned. Sontag’s might be grounded in exploring the otherness of the past. Yet it is Berger who needs the story to be ended before it can be fully appreciated. By not ceding this point, Sontag also leaves open the possibility of discovering the otherness of now.